I know it's a bit boring seeing so much about my tattoo but seriously, I've been so busy doing nothing - on Jesse's request. All I do is serve him all day, playing Minecraft and Lego Batman. He is refusing to go anywhere as he says he's still tired. I know it was only a week ago he was in hospital but he is pushing this a little bit. I'm going seriously crazy in here. So yeah, all I can report on right now is my tattoo. It's now 2 weeks since I did it, and the last week it's been insanely itchy. I started putting aloe vera lotion on and the itching disappeared. The reason is obviously the flaking. 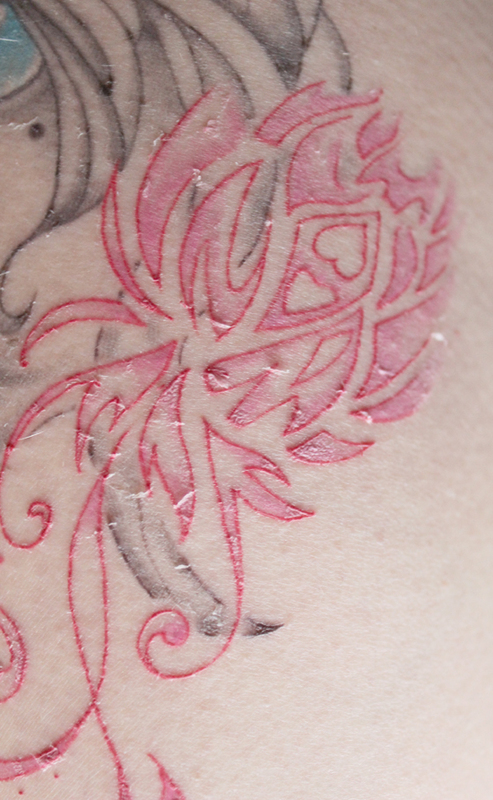 The scabs are falling off and revealing a much smoother picture underneath. It has felt weird with all the lines, like someone had simply painted it on top of the skin.